After a successful day of bombing Clark Field on December 22, 1944, the 22nd Bomb Group returned to the area on December 24th. There, they were going to target Japanese aircraft located in revetments and parking areas. Several miles outside of Clark Field, the B-24s and their P-47 fighter cover were jumped by 20-40 Japanese fighters. Two Zeros dropped air-to-air bombs, which did not damage any of the B-24s, and neither did the phosphorus bombs that were dropped by the Japanese fighters. Above the 22nd flew a lone Betty bomber, which was most likely radioing airspeed and altitude information to the antiaircraft batteries at Clark Field. This proved to be a problem for the B-24s, as they were greeted with heavy, accurate antiaircraft fire from the Japanese. Right after 1/Lt. Cameron B. Benson released his bombs over the airfield, his B-24 was rocked by an explosion in the rear fuselage that also damaged the tail section and the hydraulic lines. The explosion nearly broke the aircraft apart, instantly killing the radio operator, T/Sgt. Paul Deis, who had been manning the right waist gun. At the left waist gun, T/Sgt. Vernon J. Farup, an assistant engineer, sustained injuries to his legs from shell fragments. 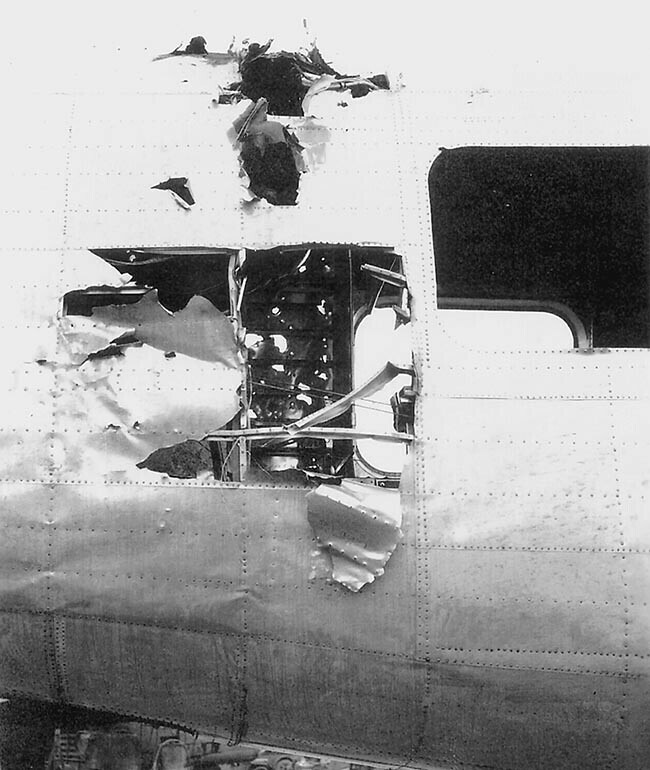 Ammunition aboard the plane began going off and members of the crew rushed to toss the boxes of ammo out the windows. None of the 2nd Squadron’s six aircraft escaped Clark Field unscathed. Lieutenant Scott’s aircraft was hit multiple times by flak, one of which damaged the gears for the bomb bay doors. Once Scott made it back to base, he had to land with the bomb bay doors open. Lieutenant Barron left Clark Field with a hole in the right wing between the two engines that punctured the fuel tanks and leaked 600-700 gallons. Both Benson and Barron were able to land safely at Tacloban. Back at Clark Field, the 19th Squadron was attacked by about two dozen Japanese fighters before they began their bombing run. They were able to fend off the attackers and make their runs. Only two out of the five B-24s from the 19th made it through unscathed. Captain Hume and his crew managed to escape serious injury and aircraft damage when a shell went through their plane, then exploded above it. Two of the 33rd Squadron’s B-24s were damaged, though none of it was severe. Gunners managed to pick off three attacking Zeros with a fourth probable. Three of the 408th Squadron’s aircraft were holed, but also without any serious damage. In spite of the heavy opposition from the Japanese, the 22nd left Clark Field knowing that their attack was a success. Many of the Japanese planes on the ground were damaged and at least 15 were destroyed. A total of four Japanese fighters were shot down, with a few more probables. The 22nd refueled at Tacloban, with Benson’s, Barron’s and a third crew distributing themselves among the rest of the B-24s that were capable of flying back to Angaur. Farup stayed behind in the hospital at Tacloban. That night and the next day, the 22nd rested and celebrated Christmas. They would return to Clark Field the following day. This story can be found in our book Revenge of the Red Raiders. On the Philippine island of Luzon, elements of the 312th Bombardment Group, nicknamed the Roarin’ 20’s, sweep across Japanese-occupied Clark Field near Manila on January 14, 1945. 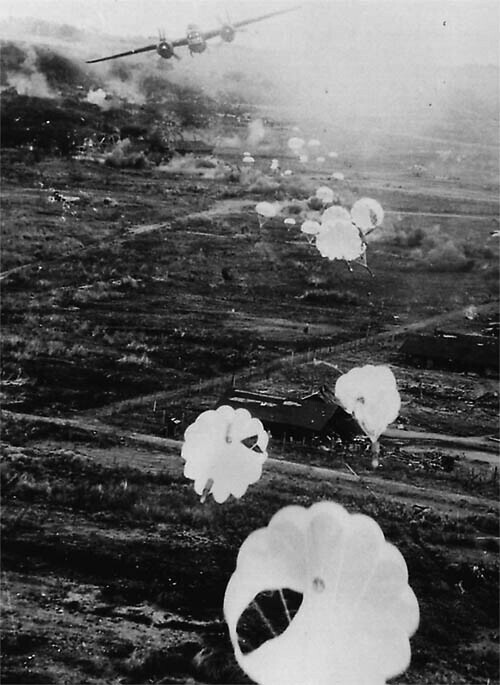 The attack was executed in a line abreast formation at 100 feet or less above the airfield complex. First lieutenant Wilbur L. Cleveland of the 387th Bomb Squadron, flying an A-20G sporting a winning poker hand with the face of Batman’s nemesis, “the Joker,” narrowly avoids colliding with the squadron commanding officer, Capt. John C. Alsup, in his fatally damaged A-20. A burst of flak had just exploded in the bomb bay of Alsup’s A-20, causing it to nose up and burst into flames. It then crashed into the target, killing him and his gunner, Cpl. Oscar C. Rush. The third plane was flown by 1/Lt. Ormonde J. Frison of the 386th Squadron. Clark Field was the most important and heavily defended Japanese airfield on Luzon, and the low-level attacks were key to neutralizing Japanese airpower on the island during the critical week of the American amphibious landing at nearby Lingayen Gulf. This artwork is published in our book Rampage of the Roarin’ 20’s. Buy a copy of this print on our website. Tainan, Formosa was to be the target for the 408th and 33rd Squadrons of the 22nd Bomb Group on April 14, 1945. The crews hoped to destroy Japanese kamikaze aircraft as well as their runways. After taking off, the 408th Squadron joined up with the 2nd Squadron, thinking the B-24s belonged to the 33rd Squadron. It wasn’t until the 2nd passed Tainan on its way to Taichu that 2/Lt. Richard S. Cohen, the lead navigator of the 408th figured out something was amiss. He went up to his pilot and suggested that they make a 180 degree turn if they wanted to attack Tainan. As the aircraft arrived over Tainan and lined up for bombing runs, they were targeted by the gunners below, who hit five of the six 408th B-24s. Still, none of the planes were brought down by the antiaircraft fire. The bombing runs were a little more challenging, as the pilots had to perform evasive maneuvers, but both the 33rd and 408th Squadrons were satisfied by the amount of damage caused: several fires were started in a revetment area, buildings, as well as three oil and gas fires. It wasn’t long before the squadrons formed up and headed back to their base at Clark Field. Second Lieutenant Rudolph L. Riccio was having a hard time keeping up with the 408th formation in his B-24 TEMPERMENTAL LADY, which had a cylinder head shot off during the raid, two feathered engines, and a damaged hydraulic accumulator. First Lieutenant John K. Mires noticed the slow B-24 and hung back with Riccio’s plane just in case they were jumped by enemy fighters. Upon approach to Clark Field, Riccio and his crew assessed their situation. TEMPERMENTAL LADY was going to be facing a tough landing without brakes or hydraulic power on two fully functioning engines, with a third sort of functioning. He asked his crew if they preferred to bail out or wanted to sit through the landing. All chose the latter. To help the plane stop, parachutes were tied to the waist gun mounts and opened immediately after the B-24 landed. Further complicating the landing and taxiing was a strong crosswind that was blowing the plane to the right. Riccio was forced to apply power to the #4 engine to counteract the wind, which didn’t help slow the aircraft. He was faced with two choices: either go off the end of the runway and hit a bunch of crates and vehicle or cut the power and let TEMPERMENTAL LADY drift into a ditch. 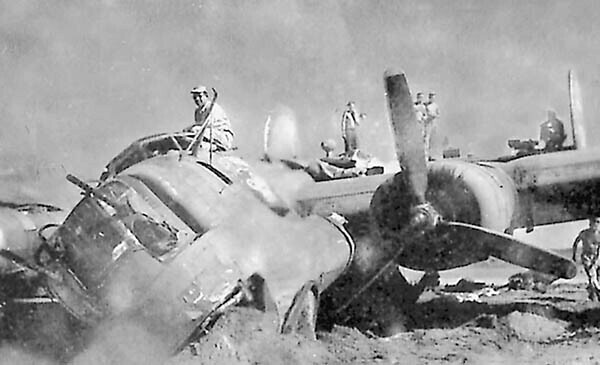 Riccio chose the second option and the B-24 rolled to a stop in the ditch. Everyone got out safely and without injury. Later, crews were trying to pull the aircraft out of the ditch and broke its back. Once the plane was finally being towed away, the cockpit area was destroyed when the plane caught fire after electrical sparks hit the still-connected batteries. Thus was the sudden and sad end of TEMPERMENTAL LADY, the oldest B-24 in the 408th Squadron. Find this story on pages 399 and 400 of our book Revenge of the Red Raiders. A few days prior to the attack on Pearl Harbor, Maj. Gen. Lewis H. Brereton, commander of the U.S. air forces in the Philippines, was closely watching the deterioration of diplomatic relations between the U.S. and Japan. A 500 mile gap that stood between the 35 B-17s under his command at Clark Field and Japanese air forces at Formosa, which was well within flying range of Japanese fighters. Concerned, Brereton requested permission to move the B-17s 500 miles south to the airfield on Del Monte, which was still under construction. On December 4th, permission was granted to move eight planes each from the 14th and 93rd Bomb Squadrons of the 19th Bomb Group. Four days later (since they were on the other side of the International Date Line), word of the Japanese raid on Pearl Harbor quickly spread around Clark Field and the men stationed there knew that it was only a matter of time before their base was attacked. Three times, Brereton requested permission to attack Formosa, which, owing to the chaos in Hawaii, was denied. Still, at 0830 15 B-17s took off to patrol the area. Brereton received a call from MacArthur himself a couple of hours later, granting him permission for the strike. As crews prepared for the attack, a radar station on the west coast of Luzon at Iba Airfield picked up incoming Japanese aircraft before communications were cut off as the airfield was attacked. They would arrive over Clark Field within an hour. When the raid on Clark Field began, only the P-40s had been able to take off and they had been diverted from protecting Clark Field. Just like the scene at Pearl Harbor, B-17s were lined up on the runway, easy targets for the 53 “Betty” bombers above. The Japanese had expected a fierce fight from the Americans instead of a repeat of what happened hours earlier in Hawaii. Men could only watch helplessly from foxholes as their planes were bombed and strafed. In the end, most of the B-17s and about a third of the P-40s were destroyed. In the days following the Clark Field attack, most of the 19th Bomb Group air and ground crews were moved to Del Monte. The few that stayed behind tried to repair some of the B-17s that had been damaged and to stage missions. Between combat and reconnaissance missions and being on the receiving end of several Japanese strikes, the number of operational B-17s dwindled. Allied forces had to withdraw to Java by the end of December 1941 and on February 26, 1942, all forces were ordered to withdraw from Java to Australia. By this point, the 19th Bomb Group’s replacement, the 43rd Bomb Group, was sailing toward Australia on the Queen Mary. As 1945 opened in the Pacific Theater, the Allies were advancing through the Philippines. Their next major target would be a three-unit attack on the Japanese stronghold of Clark Field on January 7th. At the time, the Japanese had put more than 400 antiaircraft guns in the area, which would make the planned 120+ A-20 and B-25 raid more challenging. Three bomb groups, the 345th, 312th and 417th, would split into formations and fly an “X” pattern over Clark Field. Above them, two P-38 squadrons would keep an eye out for enemy planes. Upon arriving at the mountain pass that stood between the crews and Clark Field, heavy clouds blocked their path. The formation split up in the thick clouds as pilots navigated through the pass, temporarily invisible to each other. Emerging on the other side of the clouds, the 312th’s flight leader, Lt. Joseph Rutter, and his wingman, Lt. Jones, arrived at Clark Field without the rest of their formation. Rutter feared that he might have arrived late and began his run on Clark Field—alone. Jones had chosen to circle back and rejoin the formation, which was about a mile behind him and Rutter. Lt. Rutter’s A-20 took this photograph of the B-25 flown by Floyd N. Fox of the 499th Bomb Squadron maneuvering to avoid the parafrags released from Rutter’s aircraft. Finally, the first formation of the 312th began a run over Clark Field. “At the turn-in point the B-25s wound up between us,” 386th Squadron 2/Lt. Bill A. Montgomery wrote, “The result was that I came in behind several, and as I traversed the target area, I overran them en route. It was a mess.” The slower B-25s were being overshot by the A-20s and ended up on the receiving end of the parafrags being dropped from above. “…after getting ahead it was my turn to receive [the B-25’s] bouncing tracers, not to mention the parafrags and various assortment of other bombs being delivered.” In short, it was pure chaos. 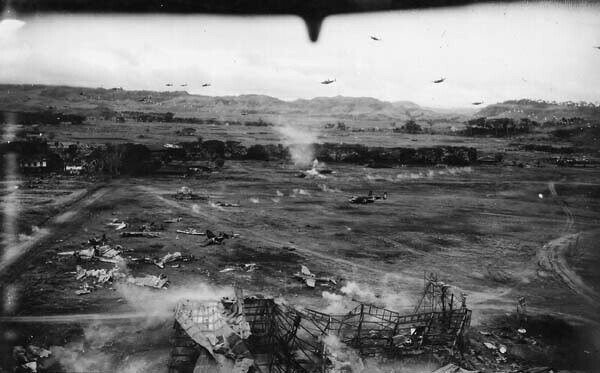 Aircraft from the first wave are seen attacking Clark Field on January 7th. The tail of a wrecked G4M Betty bomber from 261 Kokutai is at center left. The gray wreck at lower center is a Ki-46 Dinah reconnaissance aircraft. Not only were the bombers being shot at by the Japanese from below, Zeros were dropping phosphorus bombs on them from above. Fortunately for the bombers, the phosphorus bombs did not explode until after the planes had already flown out of harm’s way. Soon enough, it was time to leave Clark Field and turn for home. Congested air space and chaos aside, the attack was determined to be a success. A total of 19 Japanese fighters and 12 bombers were destroyed. Clark Field was no longer a major obstacle for the Allies. Between all three groups, 11 planes were lost. Two days later with little opposition, the American invasion force landed at Lingayen Gulf. 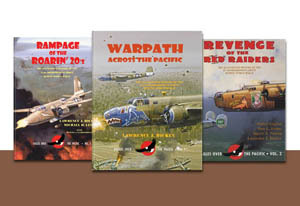 Read more details about this attack in our books Warpath Across the Pacific and Rampage of the Roarin’ 20’s. On the Philippine island of Luzon, elements of the 312th Bombardment Group, nicknamed the Roarin’ 20’s, sweep across Japanese-occupied Clark Field near Manila on January 14, 1945. The attack was executed in a line abreast formation at 100 feet or less above the airfield complex. First lieutenant Wilbur L. Cleveland of the 387th Bomb Squadron, flying an A-20G sporting a winning poker hand with the face of Batman’s nemesis, “the Joker,” narrowly avoids colliding with the squadron commanding officer, Capt. John C. Alsup, in his fatally damaged A-20. A burst of flak had just exploded in the bomb bay of Alsup’s A-20, causing it to nose up and burst into flames. It then crashed into the target, killing him and his gunner, Cpl. Oscar C. Rush. The third plane was flown by 1/Lt. Ormonde J. Frison of the 386th Squadron. Clark Field was the most important and heavily defended Japanese airfield on Luzon, and the low-level attacks were key to neutralizing Japanese airpower on the island during the critical week of the American amphibious landing at nearby Lingayen Gulf. This artwork is published in our book Rampage of the Roarin’ 20’s. You can also purchase this piece through our website. Also, don’t forget to check out our new ebook, Stories from Fifth Air Force, on Amazon! By the time March 1945 arrived, the 22nd Bomb Group was packing up for their move to Clark Field around the middle of the month. Their move from the muddy base of Guiuan to dry, dusty Clark Field was welcome, but problematic. The dust got into everything and considerably lowered pilots’ visibility on takeoff. Clark Field wasn’t completely ready to accept a full bomb group, with tents and other buildings still needing to be built. For a short while, the men slept in the cold night air under the stars, ready to spring into action if any Japanese wandered through camp. This happened on a couple of occasions: once, to blow the tails off C-47s and another night to set a pressurized fuel transfer line on fire. Soon, a new campsite was designed by Lt. Col. Nicholson and the Group hired Filipinos to do the work. Well-built tents and buildings sprung up and the men happily settled into their new home. They still had to deal with Japanese sneaking in, but that was less of an issue now that they were sleeping in tents again. The move to Clark Field didn’t stop the rivalry between the 33rd and 408th Squadrons, who continually tried to outdo each other to show which squadron had the best planes and crews. At the end of a mission, for example, each squadron would make a pass over the landing field in perfect formation. At Clark Field, the campsite was a little ways away from the airstrip. Incoming supply planes would buzz the tents to let the truck drivers know it was time to meet the B-24s at the strip. This inspired a contest between the squadrons. 408th and 33rd men decided to see which Squadron could do the most exciting buzz job over the camp. The 33rd started the contest by making a low pass a few feet above the tents, generating cheers from the men below. The next day, the 33rd’s fly-by was mentioned by 408th Capt. Bill Goodman to his former co-pilot, 2/Lt. Jake Jacobs, who had delivered a load of supplies. Goodman tried to convince Jacobs to outdo the 33rd on his way back to Guiuan. At first, Jacobs objected to the idea, but then decided otherwise, due to the fact that the weather was perfect and he’d have a lighter aircraft that was easier to maneuver. Jacobs took off, circled around, then dropped down and flew across the tent rows. He flew low enough that the fuselage was below the tent tops, causing men to dive for the ground when the B-24 came through. As he zipped through a row, he noticed a radio antenna had been added since his last flight. He immediately pulled back on the yoke to gain enough altitude and narrowly avoided hitting the pole. After headquarters found out about the stunt, future campsite fly-bys were banned. The 408th, though, remained the holder of the best buzz job. Can we stay in touch? Enter your email to keep track of what we're up to by getting our latest stories delivered to your inbox. Ken's Men Against the Empire, Volume I is now available for purchase. 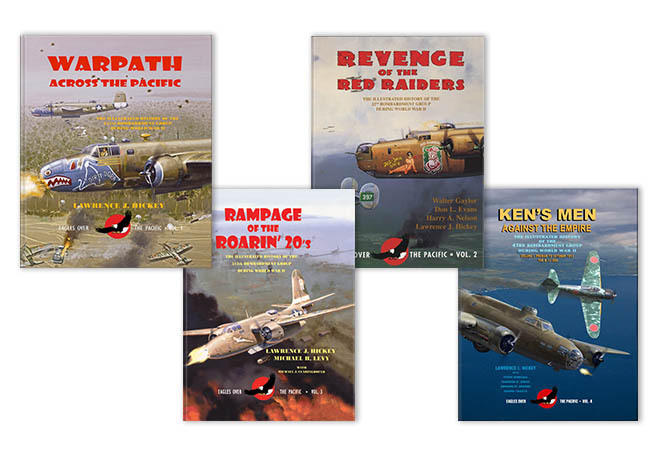 We have two ebooks available for purchase: Rampage of the Roarin' 20's and Stories from Fifth Air Force. Click over to our website to buy our books, get involved, and read about our book projects. Our books are also available for purchase on Amazon and Gumroad.